TORONTO, ONTARIO--(Marketwired - March 16, 2015) - Editors note: There is one photo accompanying this press release. Tristan Gill, a student at Académie catholique Ange-Gabriel in Brockville, is the recipient of the highest honour that the Ontario Secondary School Teachers' Federation (OSSTF/FEESO) can bestow upon a student-the Student Achievement Award (in honour of Marion Drysdale). Gill won the French category in the prose or poetry division of this prestigious award for his entry entitled, La transformation de tous. He was supported by his Special Education Assistant Pastel Andress. "The judges were taken by the hopeful and encouraging sentiment of Tristan's writing as well as his unique approach to the assigned theme," said OSSTF/FEESO President Paul Elliott. This is the 27th consecutive year in which the Federation has presented the Student Achievement Awards (formerly known as the Marion Drysdale Awards). This year each winning student was awarded with a cash prize of $1,000 and a framed certificate. Entries are judged at four successive levels: school, district, regional and provincial. The competition is open to all Ontario public high school students. This year's theme was "Transforming character(s)…." The contest is named after Marion Drysdale who died of cancer in 1983 just after retiring from the position of secretary to the general secretary of OSSTF/FEESO. Drysdale was noted for her keen interest in reading and history. Académie catholique Ange-Gabriel student Tristan Gill is the winner of a 2015 OSSTF/FEESO Student Achievement Award. 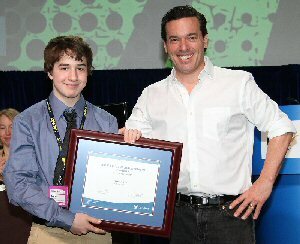 Presenting Gill (left) with his award is OSSTF/FEESO's Guest Speaker, Joseph Boyden, Canadian Novelist.